I am an artist and one of the now too few independent designer craftspeople producing two dimensional ceramics and tiles! 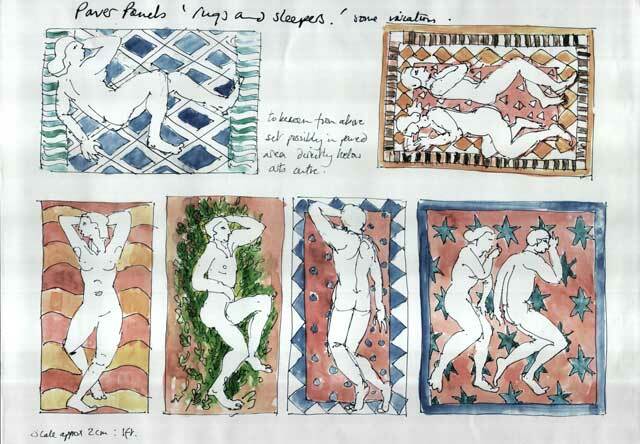 For over 30 years I have specialised in designing and making bespoke ceramic tiles. Using that expertise and artistic technique I can create for you your own original and striking tile projects. including the British Museum’s ‘5000 years of tiles’ which illustrates a wall mounted ceramic ‘sculpture’. (I make these in parallel with the tiles.) This sculptural work currently based on landscape can be seen in my studio. 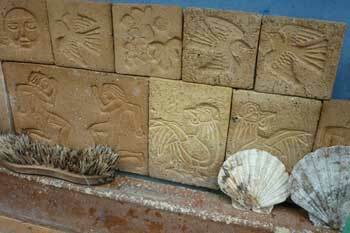 Trained as a ceramist in Cardiff College of Art I moved into the landscape of Wales like many in the 1970s, building a massive truck kiln to fire substantial slab built garden troughs and figures of high fired stoneware. Always interested in early art and civilizations it was during a visit to the Alhambra palace in Spain that I became excited by tiles which have a very long and different, often undervalued tradition to that of pot making. It was the impact they can have on a space used by people that interested me particularly. As a result I wanted to work more two dimensionally, to use line and colour on low fired earthenware ceramics and to concentrate on colour on clay wall panels and tiles, later taking up a fellowship at Bath Academy of Art and ongoing lecturing on tile making and tile history in a number of colleges along side practical making. I currently work mainly in a studio in Bath designing and making bespoke wall tiles working directly with clients. My studio is open to visitors.